Fundraiser by Noel. Abbott : Help the HUB Fund Their Move!!! Help the HUB Fund Their Move!!! The Hub Community Bike Shop originated 16 years ago in Bellingham WA. In our first iteration, we were known as The Pedal Project. We started out refurbishing used and neglected bikes, converting them into usable commuter/cruisers that we would paint solid yellow and provide free-of-use to the public. We'd basically set them loose into the world and hope that they would be shared among anyone who needed them. No rules, no check-in or check-out, just a "free" bike that could be used by anybody. After awhile, we decided to refine our strategy to provide a more hands-on approach to bicycle maintenance, recycling, and education. Thus, the Hub Community Bike Shop was born! Since that fateful day, we have been providing direct assistance to folks who need access to affordable, high-quality bikes and repairs, while also keeping used bike frames and parts out of landfills. Ultimately, our mission is to educate and empower people to be more knowledgeable consumers, and to better understand the consequences that our methods of consumption have on the environment and on ourselves. What makes a community bike shop different? Apart from selling used bikes instead of new bikes, a community bike shop offers an inherently different experience than a retail business. When you go into a retail bike shop, you'll generally notice a separation of sales & mechanic staff. You pay, your bike goes behind closed doors, and then a few days later you pick it up. In a community bike shop, the mechanics also serve as the customer service representatives: rather than leaving your bike behind, you have the option of learning from your mechanic directly, acquiring hands-on knowledge that you can take with you. This can sometimes mean that service might be a bit slower as each mechanic can only serve one customer at a time, but we believe that this approach is well worth the wait, and most folks tend to agree! Why is The Hub moving? 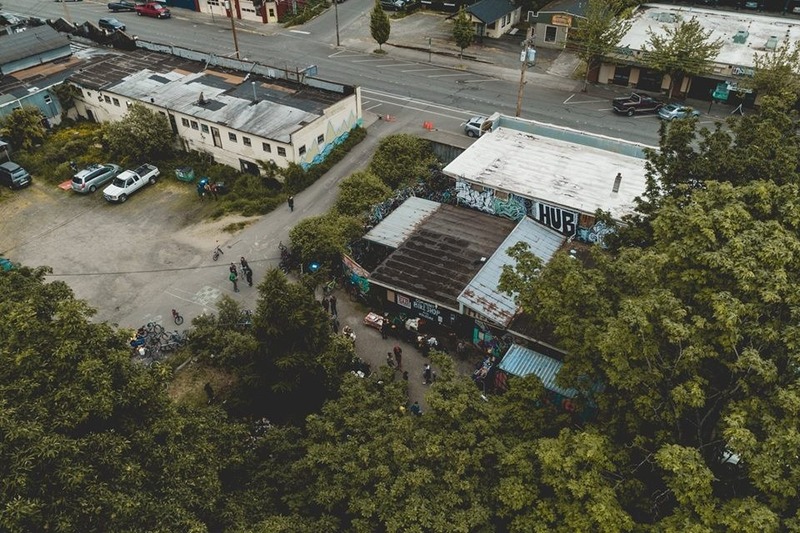 Last year, the property that is home to the Hub and several of our Alley District friends was sold to a development company with plans to erect a new housing structure. While we were generously offered a place in the new building, the project isn't slated for completion until 2020, and the space offered would not be enough for us to operate at full capacity. We were sad to say goodbye to the place that we have called home for so long, but we were determined to find a path forward -- and we did! Where are we moving to? The Hub is currently finalizing arrangements to move into a space in the business complex near Wander Brewing, across from Bellingham High School. The new space will be slightly smaller, but the location is a perfect fit: we will be able to continue offering the full array of services we've offered over the past 16 years, and we look forward to launching new community service and educational programs once we are settled in. However, we can't do it without your help! Our goal is to raise $30,000 to help cover the cost of rent and utilities for one year while we get fully established in our new space. We have also discussed some possibilities with the building owner, and if we exceed our goal, we might even be able to afford a down payment to purchase the building outright, allowing us stability and guaranteeing that we will be able to continue to serve the community going forward. In the meantime, any and all donations are appreciated! If you are unable to donate but you wish to support the cause, please share our campaign with your friends and let folks know that we're still open for general business, Wednesday through Saturday, noon to six. To help us achieve our goal, we will be running a few different fundraising campaigns through this fall, beginning with a large multi-faceted event. Hub Fest will be an all-day celebration of everything we have achieved as a community and a big yard sale of our inventory. Come peruse parts, frames, and full bikes, and enjoy the summer beauty of our alley district home one last time before we clear out.